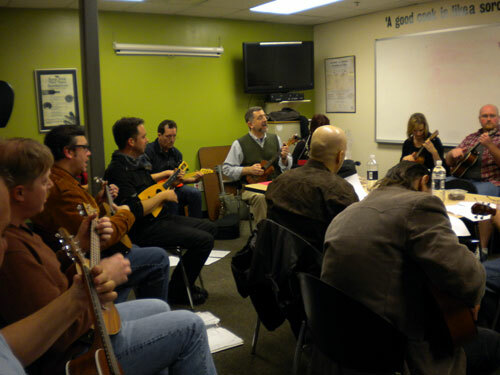 Bob Guz, one of our founders (plus a ukulele pro–or at least a pro-quality player–that’s him with the green vest in the picture to your left) did a great job leading the group in a few songs–Ring of Fire, Stand by Me, and Three Little Birds–while encouraging members of the group to stretch their picking and strumming limits. “I’m so pleased with the turnout and the level of excitement. After the meeting I had several people tell me how much they liked the meeting and are going to pass the word about our group to friends. “I even had a Central Market shopper ask, ‘What’s the deal with all the ukuleles?’ Turns out he plays and will try to make next month’s meeting. 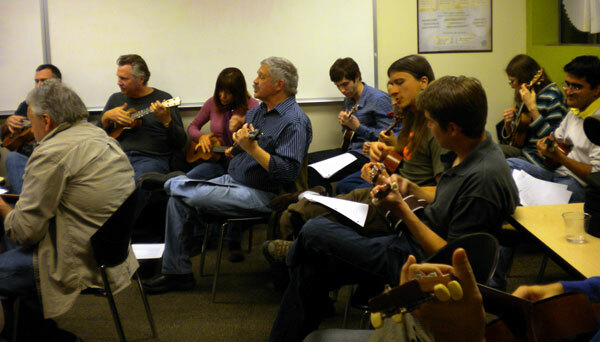 This entry was posted in AUS activities on February 11, 2011 by Austin Ukulele Society.